Is this the beginning of the turn? I think so. In only one week in the year 2000 was the market more overvalued, more overbought and more bullish than it was this week. Leverage is sky high with outstanding margin debt in brokerage accounts at record levels against cash balances and credit positions at all-time lows on a net basis. History matters. Historical measures remain relevant. By all standards of the past, the equity markets are insane. Dr. John Hussman calculates that for the stock markets to return to their mean valuation, they must fall 63%. This will not happen all at once; bear markets typically take 18 months to reach their lows. Taking its time, providing lots of false hope from furious rallies along the way, a bear market breaks as many hearts and bank accounts as possible. 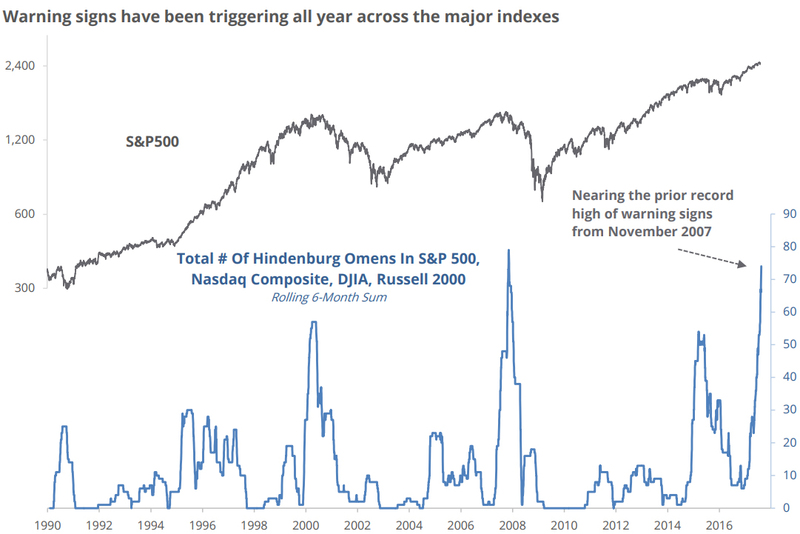 Over the last few weeks, a cluster of Hindenburg Omens has erupted across the major equity indices. This Omen focuses on readings of new highs and new lows that must each total more than 2.2% of the issues in a given index on a single day. We have never had a crash without Hindenberg Omens although we have had Omens without crashes. Nonetheless, this indicator is the best available at predicting crashes which are, after all, exceedingly rare events. The number of daily Omens is now approaching a record high as this chart from Sentiment Trader shows. The S&P500 today dropped back below its 50 Day Moving Average, recording the biggest drop below the 50 DMA since before the Trump election and falling to its lowest level in five weeks. The media will find something to blame…the Barcelona attack or the confusion over who is quitting the Trump Administration. Don’t be fooled, dear reader. This is the market signalling exhaustion at the end of an historic run. Maybe there will be no follow-through and the dip buyers will show up tomorrow morning and make everything nice again. But this is the third serious blow to the market since the first one on June 9th. Something is shifting; investors are getting more risk averse and this is a momentum market that cannot afford a growing perception of risk. I’m watching things very closely now and thinking about getting short. If this is not the beginning of a bear market, it is close in my opinion.